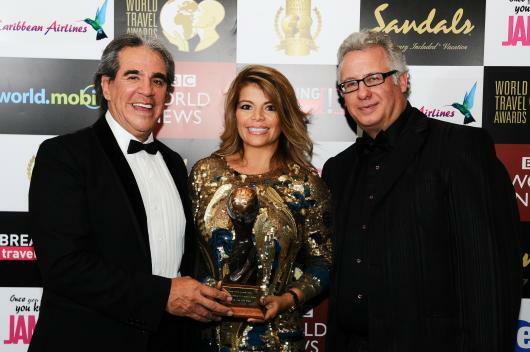 Hacienda Tres Ríos Resort, Spa & Nature Park received the prestigious 2012 World Travel Award in the All Inclusive Resort category, naming the company the best in the business in all of Mexico and Central America. Based on a survey involving 167,000 travel agencies, industry professionals and the general public from more than 160 countries, the resort (which forms a part of Sunset World Resorts & Vacation Experiences)was thrilled to accept this award as the best in the industry, worldwide. “By receiving this award, we know that we are doing things right and that inspires us to work harder. We are always looking to satisfy our guests and to keep Mexico at the top of the list of incredible vacation spots,” said Orlando Arroyo Marroquín, President of the Board of Directors of Sunset World. Hacienda Tres Ríos is an environmentally friendly, five-star, 273-suite resort that opened at the end of 2008 and was constructed in a 326-acre nature park, where you can find jungles, mangroves and coastal dunes. It has received six coveted accolades from the World Travel Awards, an organization which is considered the Oscars of the tourist industry and which has been recognizing the merits of companies with the highest standards in quality and service around the world since 1993. In 2009, Hacienda Tres Ríos hosted this prestigious awards ceremony’s first visit to Mexico, where over 200 travel industry leaders attended. On that particular occasion, the hotel received three awards: Mexico’s Leading All-Inclusive Resort, Central America & Mexico’s Leading All-Inclusive Resort and Central America & Mexico’s Leading Green Hotel. A year later, Mexico’s Leading All-Inclusive Resort Award and the Central America & Mexico’s Leading Green Hotel Award were once again bestowed upon the hotel. This year, the World Travel Awards’ red carpet gala was held at the Beaches Turks & Caicos Resort Village with the best in the international travel industry in attendance. Congratulations on receiving this prestigious award. I would love the opportunity to stay at your resort in the future.